Curating the second Spectrum Exhibition has begun in earnest. The exhibit will be a selection of original paintings and sculptures from Spectrums 12-15 on display at the Museum of American Illustration at the Society of Illustrators September 1 -- October 17th. 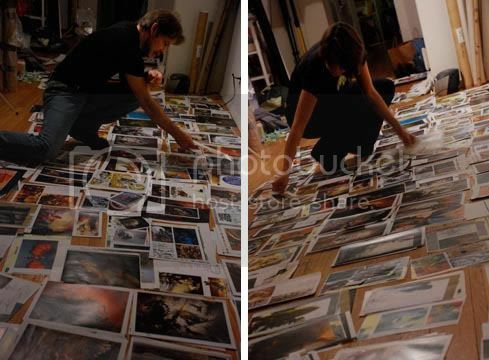 So far, the process has been to go through each edition and tag anything we want a second look at....which was a lot of artwork, much more than we could fit in the galleries. Then we took a knife to the books (yes, horrifying, but a couple books had to make the ultimate sacrifice for the good of show) so we could stack each artist's work into piles. Then heartbreaking part began -- taking 1600 images and choosing just 15o(ish) out of them. It's been a difficult process of constant reevaluation. In fact, judging this exhibit has been harder than the first, even though the first covered more than twice as many editions. The industry has become more varied and vibrant than ever before. The books have become longer (including adding a new section for concept art) and the quality-bar keeps getting raised. Nonetheless, we've got it down to just under 200 at this point...a few more tweaks and we'll have the exhibit down to a manageable level. The schedule calls for our wish-list to be done by late February, which doesn't mean that that's what the show will be, exactly -- there will be paintings that have been sold off, artists we can't reach, some that are too fragile to ship, and in one case the painting was crushed (along with an entire east side building) by a large crane, but by and large, it should start to take shape over the next handful of months. Here are a some shots from the first exhibit, including the first Art Out Loud. We have marked two days throughout the run of the show for events: demos, panel discussions, whatever we can think f. If any one has suggestions, don't be shy. Sadly the link to pictures from the first exhibition doesn't work. Thanks for the heads up, Alarie. I think its fixed now. Mathew! That's a great way to describe it. i wish I had thought f that. I can't even imagine what that must be like.. I would lose my place so many times while panning through discussing certain pieces. I like a game which you need uselast chaos goldto play. If you want to be online to play this game, I can borrow lastchaos goldto you. When you have lastchaos money, and than you can go on this game. Of cause, when you are first to play, you can buy last chaos gold. If you have enoughcheap lastchaos gold, you will be able to different games.